Evoking the warmth and joy of a cozy country Christmas, this bouquet from the trendsetters at Better Homes and Gardens® beautifully delivers your warmest season's greetings. 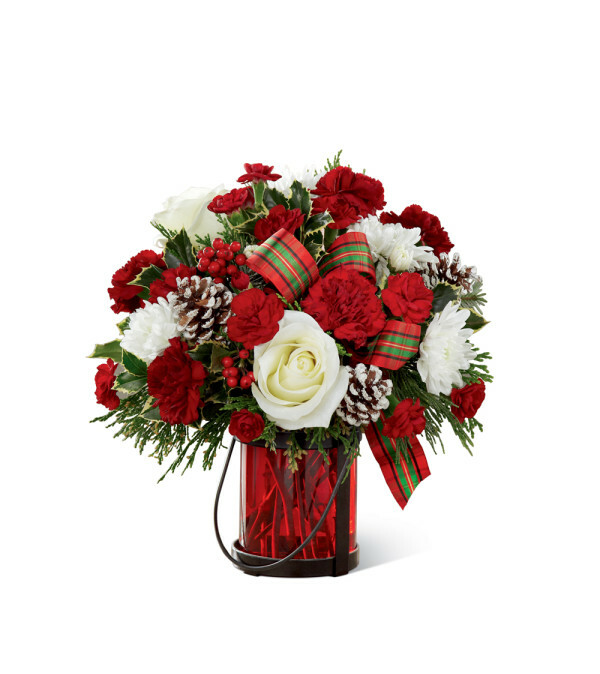 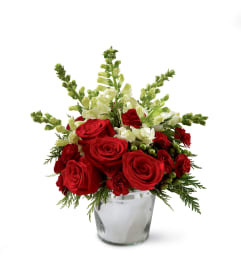 Composed of white roses (in Deluxe, Premium and Exquisite versions only) and cushion pompons, burgundy carnations, Christmas greens with holly berries and "frosted" pinecones, this arrangement is accented with bright tartan bows in a ruby-hued glass "lantern" vase with a black metal holder. 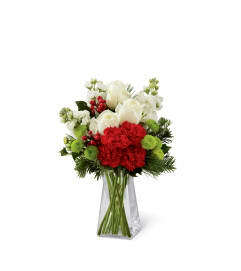 When the flowers are gone, the vase can be used as a candleholder, casting a festive holiday glow throughout the house.